Our Wangaratta dentists strive to make Michelson’s Dental Surgery a convenient location for your entire family’s oral health needs. Each of our professional, yet friendly, team members are committed to ensuring your ultimate comfort at all times. By providing you with comprehensive examinations, professional cleaning and polishing and fissure sealants, our dentists can limit the extent of treatment that you need in the future. Digital x-rays allow us to check areas between the teeth and under existing fillings to pinpoint any issues that may not be visible during your regular checkup appointment. Should you require treatment for decayed, broken or missing teeth, our Wangaratta dentists will review all possible options with you. This way, you can decide what type of treatment you would like to go ahead with. We can offer you tooth-coloured fillings, crowns and bridges or implants to enhance your smile’s health and beauty. 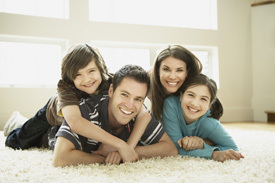 Do you find it difficult to get your entire family to the dentist? At Michelson’s Dental Surgery, we can arrange multiple appointments to accommodate more than one family member at a time. This convenient option allows you to make fewer trips to our clinic and reduce the time spent waiting on one another. A separate children’s playroom is also available to preoccupy the little ones during your family’s visit with us.